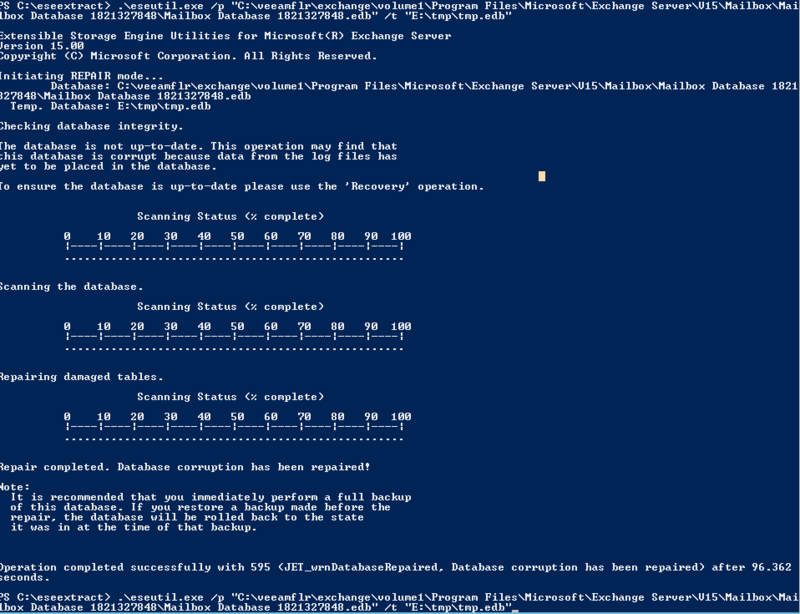 So you made a backup from your exchange server with Veeam and want to recover Exchange items. 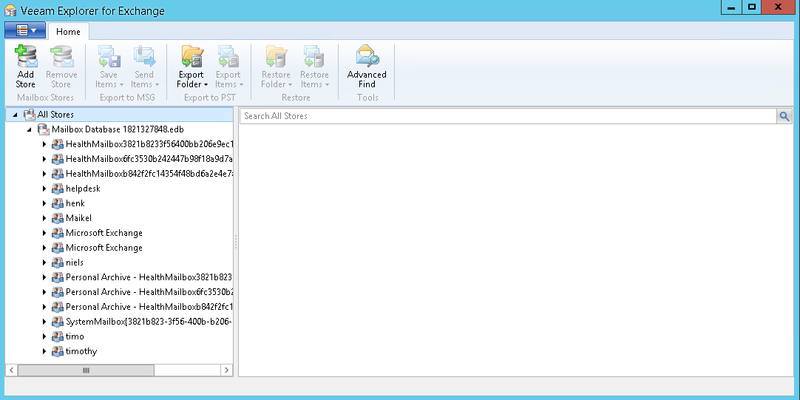 Well that is quite easy with the Veeam Explorer For Exchange. But what if you have the logs files on a different vmdk then the edb file, and you excluded the disk. Will you be able to recover from the EDB alone? Saying that you can't open the EDB because "Online Exchange backup detected, log replay is required". So what can you do? Well first start a windows file level recovery of your exchange server. cp "c:\veeamflr\exchange\volume1\Program Files\Microsoft\Exchange Server\V15\Bin\ese*" . Alternatively you can also copy them from your live exchange server. PS C:\eseextract> .\eseutil.exe /mh "C:\veeamflr\exchange\volume1\Program Files\Microsoft\Exchange Server\V15\Mailbox\Mailbox Database 1821327848\Mailbox Database 1821327848.edb"
It shows that the db is in dirty shutdown, matching the description of the explorer. So let's hard repair it without logs. The cache will be deleted automatically but it might mean that when you are repairing, it could grow filling up your whole c: drive. If you are not sure, copy the EDB to a second location where you will have plenty of space. Also you will see that the recovery process might need upto 2x the space of the original EDB. This is because it will create a TMP file to work on. So plan for that as well. PS C:\eseextract> .\eseutil.exe /p "C:\veeamflr\exchange\volume1\Program Files\Microsoft\Exchange Server\V15\Mailbox\Mailbox Database 1821327848\Mailbox Database 1821327848.edb" /t "E:\tmp\tmp.edb"
So it will give you an error that you might potentially loose data. However, remember we are reading the backup in readonly and redirecting writes to the mount_cache file so no harm done.